The Supreme Court has upheld the Allahabad High Court's directive to mills to sell sugar pledged with banks to pay cane farmers. This might make things worse for the industry, which is already mired in losses. The festival season is when the sugar mills work overtime. Indians buy copious amounts of sweets for friends, family and associates. All this translates into huge orders for the sugar barons of Uttar Pradesh. The state is the country's second-largest producer of the sweetener and has the highest number of private sugar mills. This year, there is perceptible gloom among these mills. They are mired in losses because the state has mandated such a high price for sugarcane that running the mills has become uneconomical. The mills want a new formula for sugarcane price that is linked to the prevalent sugar price. But the Samajwadi Party government in Lucknow is not convinced - it wants the interests of all stakeholders like farmers to be protected. It has asked mills to start production in mid-November or face the consequences. To make matters worse for the mills, the Supreme Court's decision to uphold the Allahabad High Court's decision that the mills can sell the sugar stocks given as security to the banks to clear the sugarcane arrears to farmers has set alarm bells ringing. The court gave its judgment on a plea by India's two major banks, State Bank of India and Punjab National Bank, against the Allahabad High Court's order. he mills draw those loans during the crushing period which drops if the retail price of sugar falls as then the value of the collateral also goes down. The Uttar Pradesh Sugarcane Control Order states that 85 per cent of this loan should be necessarily distributed to the farmers. Thus, a little over 72 per cent of the value of the pledged sugar can be used to pay the farmers. This is where electoral politics plays havoc. The Uttar Pradesh government had fixed a sugarcane price of Rs 280 per quintal for the 2013-14 crushing season that will end this month. With recovery of 9.2 (kg of sugar produced from a quintal of sugarcane) and conversion cost of 25 per cent, this translates into sugar production cost of Rs 38 a kg. 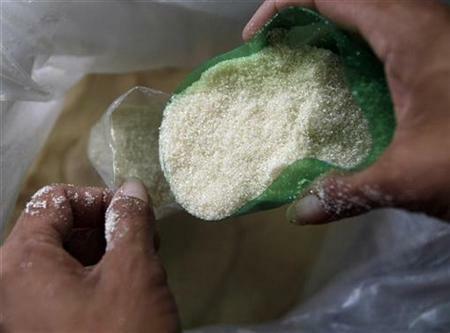 In Uttar Pradesh, the ex-mill price of sugar is Rs 28.50 per kg. That's a loss of Rs 9.50 on every kg of sugar produced. What the mills get from the banks to pay the farmers is 72 per cent of the market price, which amounts to Rs 20.52. The mills claim the price of sugarcane is unrealistic, due to which there are arrears in excess of Rs 2,800 crore as of October 14. Abinash Verma, director general of the Indian Sugar Mills Association, says unless there is a massive correction in the sugarcane price fixed by the Uttar Pradesh government - which can only happen if the purchase price is linked with the sale price - or the retail price of sugar goes up significantly, there would be arrears in the coming season as well. According to the mills, the only possible way out of this deadlock is devising some sort of formula through which the sugarcane price is linked to the actual realisation from sugar and by-products preferably in the manner suggested by the former chairman of the prime minister's economic advisory council, C Rangarajan. It had said that instead of the state-advised price, the mills should pay farmers 70 per cent of the price of sugar and other byproducts, or 75 per cent of the price of sugar. Higher the price of sugar, more the farmers will be paid and vice-versa. Maharashtra and Karnataka have already moved to this formula. The cane commissioner of Uttar Pradesh, Subhash Chandra Sharma, says the Rangarajan formula cannot be adopted in the state in its current form as it does not address several issues. "The committee does not speak about the cost of cultivation of sugarcane farmers and ignores their claim regarding input costs." According to him, the state will devise its own formula for sugarcane price which will protect the interest of all the stakeholders. The state government has formed two committees under the chief secretary and the cane commissioner on the matter. The cane commissioner's committee will hold a meeting on October 21 with the representatives of farmers, cane societies, mills, besides experts and agricultural research bodies. This committee will later give its recommendation to the chief secretary-headed panel, which will finally decide on the cane price. Once the state cabinet gives its nod to the recommendation, this price will be communicated to the mills and farmers. Cane price as a proportion of sugar price has risen steadily in the last few years in Uttar Pradesh: from 57.1 per cent in 2009-10 to 79.06 per cent in 2010-11, 81.36 per cent in 2011-12 and 88.88 per cent in 2012-13. According to Verma, the current state-advised price is 97 per cent of the value of the sugar. "With the remaining, you have to pay wages, interest, do maintenance et cetera. How is it possible," asks a mill owner. That is why most sugar stocks are trading at record lows. Meanwhile, the state has announced some tax concessions and rebates for the mills amounting to around Rs 11 per quintal of sugarcane. "Even this rebate has not been fully given - almost Rs 6 per quintal is still pending. On the other hand, cooperative sugar mills in the state have been given rebates and assistance amounting to Rs 87 per quintal, which itself is an acceptance of the difficult position that mills are facing," contends the owner of a mill. "The basic problem with the sugar crisis in Uttar Pradesh is of excessive political interference and the inefficiency of a few mills. Otherwise, the same situation would have prevailed in other parts of the country," a senior central government official says. Sudhir Panwar, a professor at Lucknow University who has been associated with the farmers' movement, feels that any chance of mills starting operations before the middle of December is remote. "Till that time, farmers will be compelled to sell their sugar to the local jaggery (gur) units as sugarcane is ready for harvest in Uttar Pradesh," Panwar says. The central government, on its part, had announced some incentives to address the crisis few months ago, but wants the mills to clear the sugarcane arrears to farmers first before further measures are announced. This is something most private mills, however, are unable to do. Liked the newest episode of Satyamev Jayate 3? VOTE!